Control a single seven-segment display, echoing user's key presses on it verbatim. We use a shift-register to reduce the number of pins we need on the Arduino to control the display. Connections for the Texas Instruments 74HC595 shift-register. Datasheet: http://www.ti.com/lit/ds/symlink/sn74hc595.pdf. 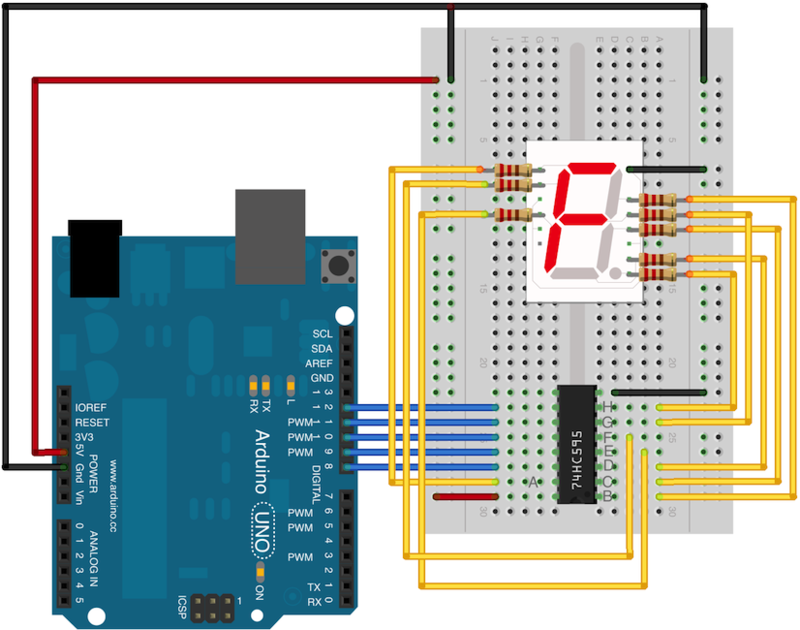 In our circuit, we merely use pins 8 thru 12 on the Arduino to control the serial, enable, rClock, sClock, and nClear lines, respectively. Since we do not need to read the output of the shift-register, we leave the bits field unconnected. Seven-segment display demo. For each key-press, we display an equivalent pattern on the connected 7-segment-display. Note that most characters are not-mappable, so we use approximations if available. We use a shift-register to reduce the pin requirements on the Arduino, setting the bits serially. The seven-segment digit we use is a common-cathode single-digit display, such as TDSG5150 (http://www.vishay.com/docs/83126/83126.pdf), or Microvity's IS121, but almost any such digit would do. Just pay attention to the line-connections, and do not forget the limiting resistors: 220 ohm's should do nicely. The shift-register is Texas-Instruments 74HC595: http://www.ti.com/lit/ds/symlink/sn74hc595.pdf. Make sure to connect the register output lines to the seven-segment displays with the corresponding letters. That is, shift-registers Q_A (Chip-pin 15) should connect to segment A; Q_B (Chip-pin 1) to segment B, and so on. We do not use the shift-register Q_H' (Chip-pin 9) in this design.